Last month, Mystery Science Theater 3000 was revived by Netflix after nearly two decades off the air. 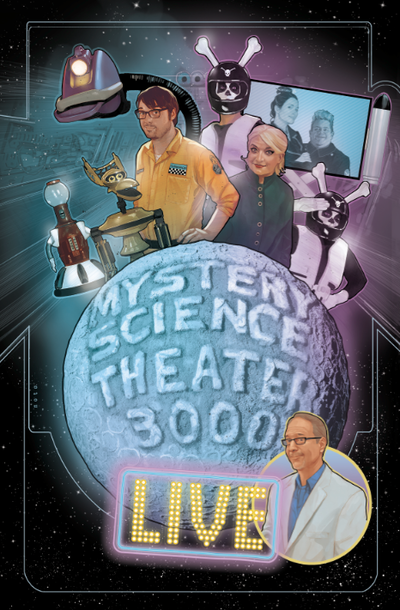 The new season has received critical and commercial acclaim, prompting the show’s creator, Joel Hodgson, to announce the first-ever MST3K “Watch Out For Snakes!” live tour. Kicking off July 6th in Boston, the tour will see Hodgson and the show’s current host, Jonah Ray, present screenings of the campy horror film Eegah, which is consistently ranked amongst the worst movies of all time. It was first featured on MST3K in 1993 and one particularly absurd line of dialogue, “Watch out for snakes!”, became a popular catch phrase on the show (and the basis for the tour’s title). A press release promises “all-new riffs and sketches” inspired by Eegah. Along with Hodgson and Ray, the tour promises appearances from the famed robots Crow, Tom Servo, and Gypsy, along with Synthia (Rebecca Hanson), Kinga Forrester (Felicia Day), and TV’s Son of TV’s Frank (Patton Oswalt). Tickets go on sale Friday, May 19th. Find the full schedule below.